Back pain, especially in the cervical and lumbar regions, is a common complaint among otherwise healthy adults. 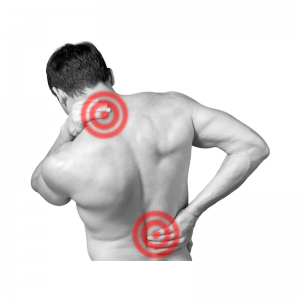 However, the presence of pain does not always indicate structural injuries. Oftentimes pain comes from pressure on nerves due to spinal and pelvic misalignment. The presence of back pain in a new client can be a bit daunting for you as a trainer, and you may have concerns about doing more damage than good. But non-specific back pain that is not associated with any sort of trauma is often the result of physical inactivity. Always insist on a thorough pre-session warm-up. Back pain often diminishes once the body starts moving, making it easier to perform weight bearing exercise. Work on core strength early on. A strong and stable core is foundational to all other fitness activities. It is not enough to train the superficial abdominal muscles (rectus abdominis and obliques). You must also focus on transverse and deep core muscles. Teach your client to engage the core during exercise. Mastering core stability while lifting will help your client achieve goals faster, with reduced risk of injury. Teach your client deep breathing techniques and incorporate them into your exercise program. Diaphragmatic breathing pressurizes the abdominal cavity, providing support and protection for the lumbar spine. Look for postural issues and address them. Tight hip flexors, lax gluteal muscles, rounded shoulders, tight hamstrings and tight chest muscles all contribute to spinal misalignments that compress nerves and cause pain. Stretch tight muscles and strengthen lax muscles to achieve balance. Teach good posture, especially during exercise. Teach perfect technique. No matter how eager your new client is to feel the burn, insist on light-weight sets until they master good mechanics. Educate about gut health. Chronic constipation and straining can contribute to pain in the lumbar spine. Listen to your client if they are complaining about pain, and teach them to distinguish between pain and discomfort. Never insist that they work through genuine pan. Encourage icing or cryotherapy after every session to promote recovery and reduce pain. Monitor your client carefully in the first weeks, and encourage them to seek medical treatment if their pain worsens.